Lots of building, lots of progress, but no time to blog, lately! I've been obsessing about getting all the planks onto Cabin Boy's too-long naked frames. I went as fast as possible, but it turned out to be very difficult to do more than one plank per day. 1. Cut the rabbet in the starboard side of the stem. 2. Carve the hood end of the spiling batten so it fits perfectly into the garboard and into gain in the previous plank. 17. Wipe all the bits that will be epoxied with alcohol. 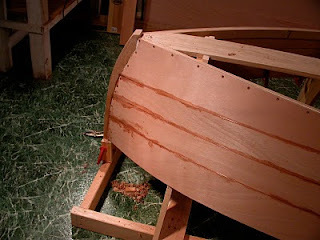 This is supposed to make the epoxy stick better, particularly to oak. 18. Find a beautiful woman to hold other end of plank. 20. Quickly apply a light coat of epoxy to all the bits that will be fastened: the stem rabbet, the previous plan, the transom, the new plank... This allows the wood to soak up some epoxy. 23. Find out where beautiful woman has wandered off to, before epoxy dries too much. 25. Work your way towards the back of the boat, using every clamp you can find. Make attentive, appreciative noises as you listen to story told by beautiful woman. 26. Drill counter-sunk holes (3) through hood end of plank into stem. 30. Wipe excess glue off of inside and outside of plank. 31. Thank beautiful woman for the cold Blue Moon she's holding out to you. 34. Next day, go to step 14 for Port side plank. Whew! And this is the 'easy' method. I can only imagine what it would be like to cut the planks out of cedar and rivet them into place. That will have to wait for my next boat. One interesting complication: The sheer plank was longer than my pattern stock, so I had to make my first scarf, in 1/8" luan plywood. It was pretty easy to do. The 12:1 scarf wasn't very long or very deep. I just used my little block plane to cut the scarfs free hand. Then, I just glued them up, using a scrap of wood to spread the pressure. 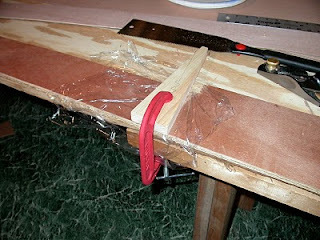 By the way, I'm told you don't want to use too much clamping pressure on epoxy joints. When you are building a lapstrake boat, you need to mark the 'laps' on all the planks and all the gains. I decided to use a 3/4" lap for all my planks. That means I had to draw 16 lines on 8 planks, each line 3/4" in from the edge. You can save yourself some trouble, and draw more accurate lines, if you make yourself a home-made lap guide, as shown in the picture above. The notch in the upper right hand end is 3/4" deep. Once you've got your guide made, you just put it against the edge of the plank, hold your pencil against the guide, and move it along the edge. A perfect line, every time. By the way, I should be holding the pencil at a lower angle. I try to hold the pencil so the sharpened side is flat against the side of the gauge. That's the easiest way to get a consistent line, I think. So, after executing the above steps 8 times, and if your boat was designed by an artist like John Atkin, this is what you get. Beautiful! Photographs just don't do justice to the graceful curves and twists in the planks as they swoop into Cabin Boy's stem. Wood -- even plywood -- is such an elegant material to work with. And by the way, I didn't have to steam any of the planks. They bent into shape easily with fairly light clamping pressure. Finally, it was time to plane down the edges of the garboard planks and chine logs, in preparation for putting on the bottom. 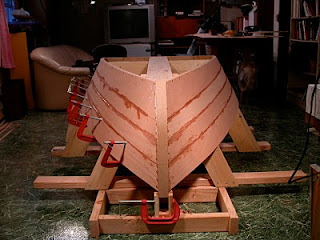 The goal is to be able to lay a straight edge from one side of the boat to the other and have it lie flat on both sides. This sounds harder than it is to do. I think these old, wooden planes know how to do the job, themselves. You just need to trust the tool and let it do it's thing. So the next step is to put the bottom on. Yahoo! But this weekend, I'm heading up to the Maine Boat Builder's show, in Portland. I should be there all day Saturday, so if you happen to be at the show that day, say hi! Should be a fun time! When you get around to doing it the traditional way, only a couple of things change. There are still about as many steps. 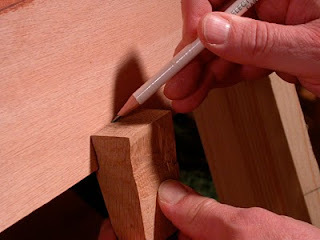 First, simply exchange the spreading epoxy step with either a clinch nailing or a riveting step. In this step, the beautiful woman holds a clinching iron while you hammer nails. The noise of such makes the beautiful woman's story a bit more difficult to hear, or maybe it makes the story riveting? Second, the waiting for epoxy to dry step is postponed to the end when all the laps are sealed at one time with some sort of caulk goo. Then, you wait once, and spend a long time removing goo from your hands, your clothes, the dog that walked by, and everything you touched while working with the goo. In the meantime, the beautiful woman is drinking the last of your Blue Moon. As I am in Melbourne,Australia and wont be able to make the Maine Boatshow, how about you post some pictures of the cool things you see up there. Trusting and enjoying your commentary Im sure it will be better than news reports I would be able to find. By the way Cabin Boy is coming along very nicely. Look forward to the next Edition of UBB. 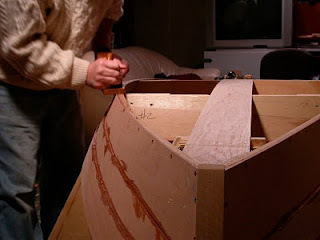 John- Try using hot melt glue sticks for the spiling battens- used them to great advantage on a Hylan Beach Pea and Catspaw Dinghy I built last year. Were you at the Maine Boatbuilders Show this weekend? Yes, I was at the show. See next blog post. How would you use the glue sticks? You mean to glue the battens together? Ah... that would save some time. Have to remember that! Thanks. All those BBBB's (building beautiful boats books) expand on bevelling. Your trick on the width of the lap seems really nifty. But how did you figure the right angle to plane? There is no angle on the lap gauge, it's just to mark the distance from the edge of the plank. 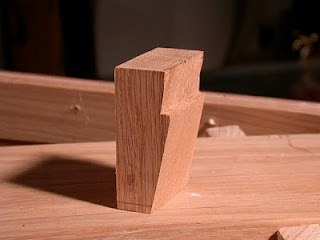 I built it out of an odd shaped piece of scrap wood, but the angles on that scrap are accidental and have no meaning. 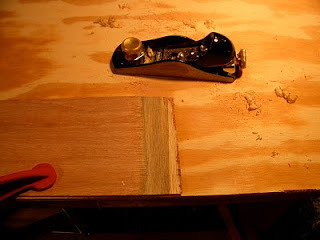 The angle that the gains are cut is very shallow... if the gain is 2' long, say, then you just plane it by eye, from nothing, to just short of the thickness of the plank. I'm sure the angle, if you could measure it, would be just a few degrees. Oh... marking the gains is part of step 16, I guess.